In many online games, beginning players are usually called “newbies”. As time passes, some of them will progress and lose that label to become experienced players, while other, less talented individuals go from catastrophe to catastrophe and find themselves saddled with the pejorative label of “NOOB”. 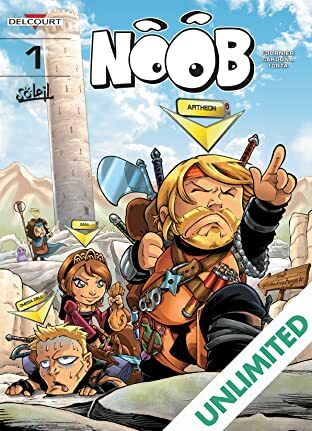 Follow the adventures of Arthéon the warrior, chief of the disastrous guild known as “Noob”, Gaea the summoner, Omega Zell the macho and egocentric assassin, and let's not forget the worst of all, Sparadrap the simpleton priest. Will they be able to stand each other long enough to cooperate, to explore dungeons, cross vast planes, and confront terrible monsters to advance from level to level? A CRAZY NEW SERIES THAT BLENDS THE WORLD OF ONLINE GAMES, HEROIC FANTASY, AND GEEK LIFE!